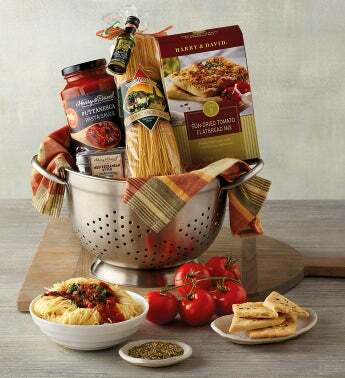 Send the Italian food aficionado on your list this impressive stainless steel colander filled with everything you need to complete a lovely gourmet meal from the comfort of your own home. Garlic angel hair pasta, puttanesca pasta sauce, and sun-dried tomato flatbread mix lend a specialty touch to the whole feast. Finished with a lovely plaid dishtowel, this gift is as useful as it is savory and enjoyable.